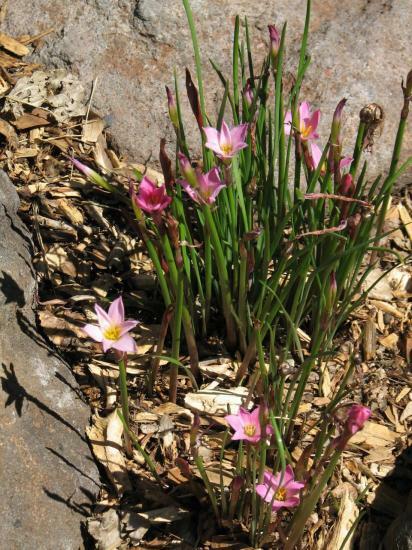 Zephyranthes are commonly called rain lilies since they often come into bloom after it rains. 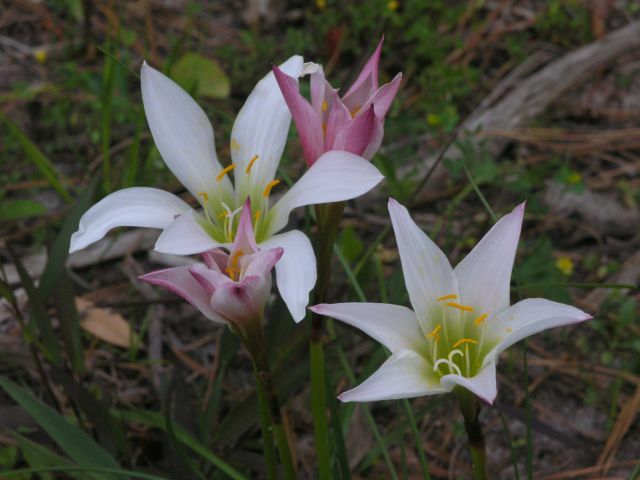 From the Amaryllidaceae family, they are native to the southeastern United States, Central America, and South America. Most are spring or summer flowering. 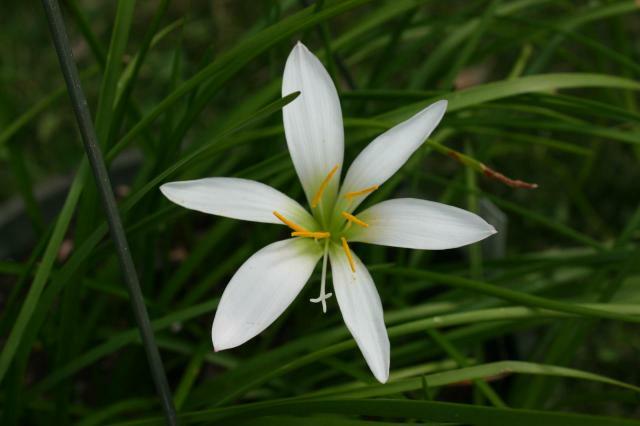 Zephyranthes flowers are very similar to Habranthus flowers and both are called rain lilies. 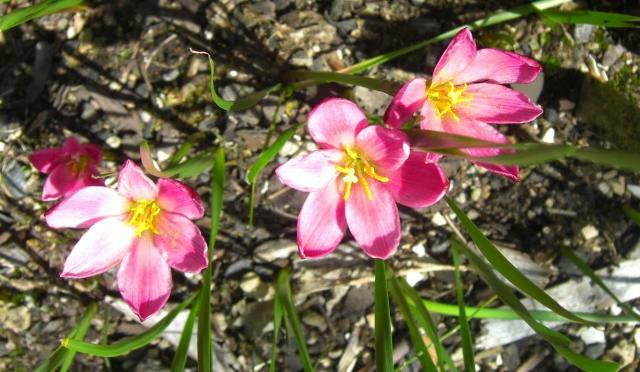 Habranthus flowers point upward BUT at an angle and have unequal stamens, and Zephyranthes flowers point straight up and have equal stamens. 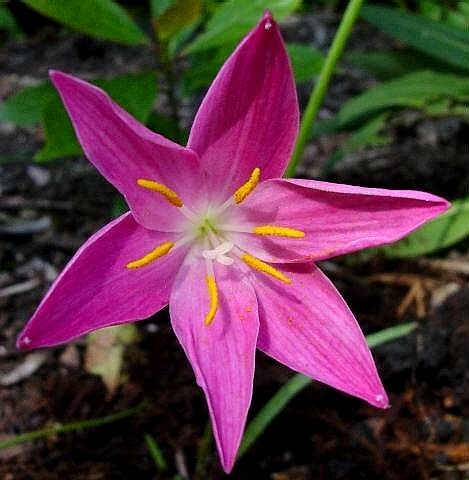 Zephyranthes flowers tend to be star shaped and Habranthus have somewhat irregular flowers. Additionally, the seeds of Habranthus are slightly winged (and thicker). Cultivation from seed is easy in this group. Seeds are papery and can be floated but they sprout very easily sown under just a thin covering of sowing medium. Sow the seeds in a well-drained mix and keep in a warm place. 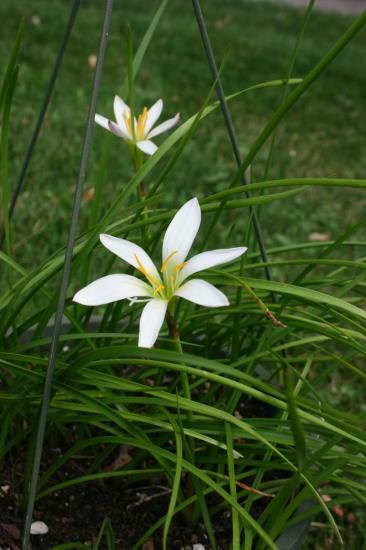 The seedlings will grow well in warm weather and respond well to fertilizer. 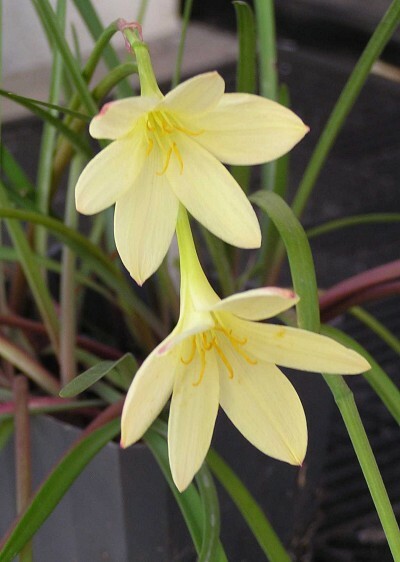 As with any papery seeded amaryllids, these have a relatively short viability period. 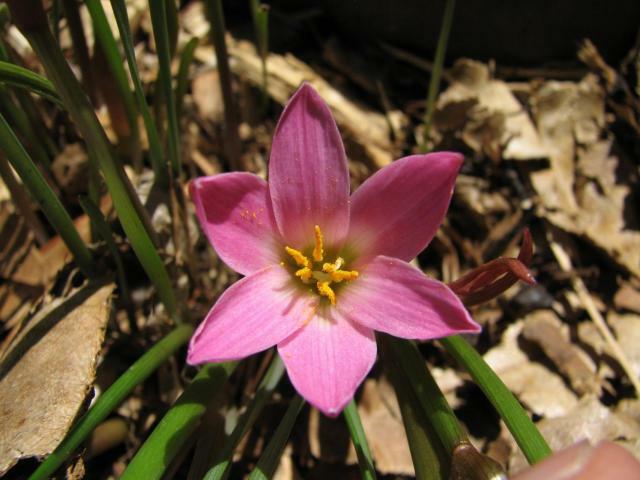 Zephyranthes americana (syn. Haylockia americana). 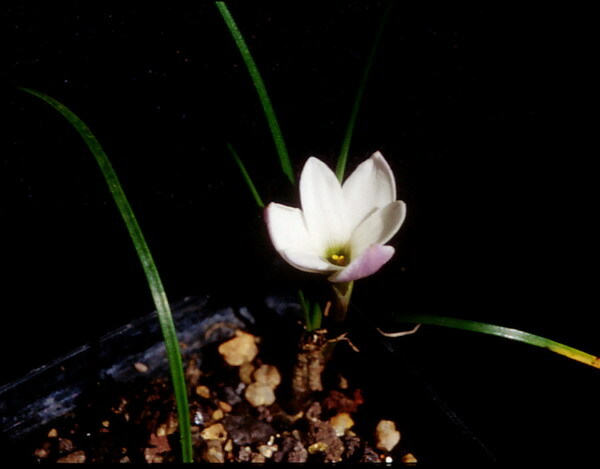 The photos below were taken of plants grown by Hans Joschko. 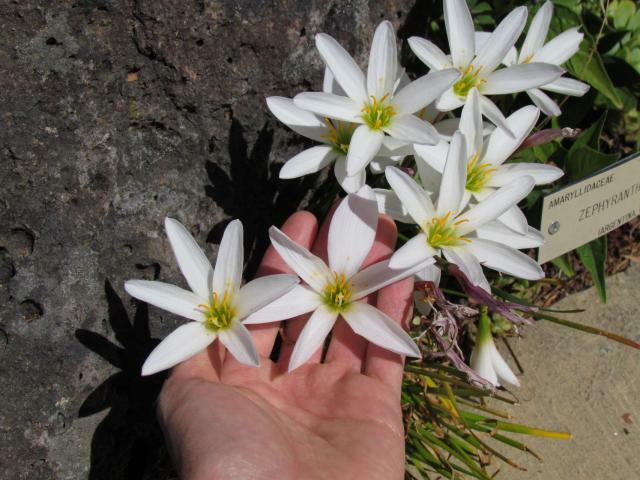 Zephyranthes andina (syn. Haylockia andina). 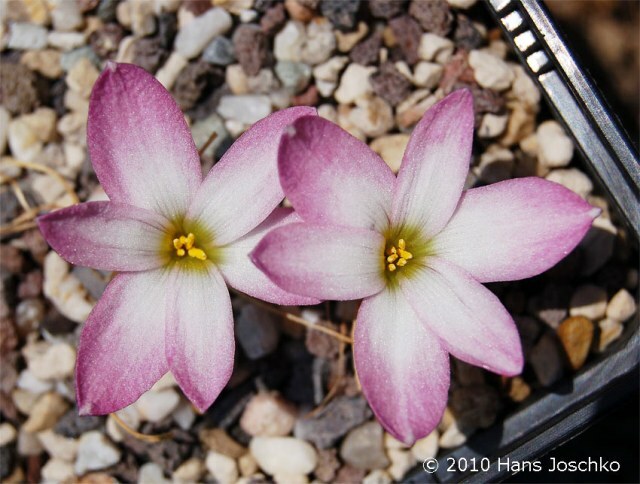 The photos below were taken of plants grown by Hans Joschko. 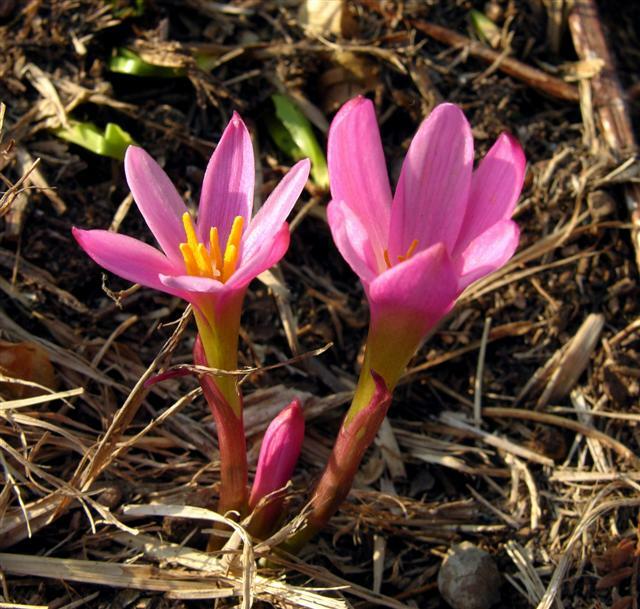 Plants starts to grow in spring and flowers just before the leaves appear. They were collected in Argentina in the north, near St. Victoria at an altitude of 3040 m not far away from the border of Bolivia. 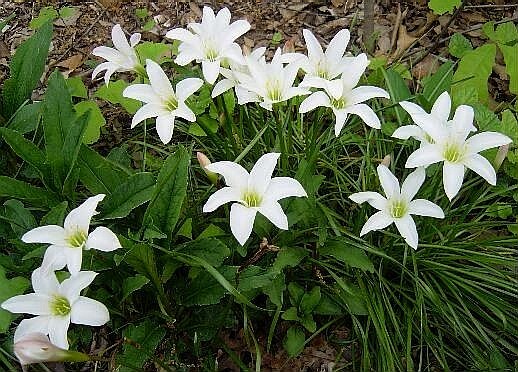 Zephyranthes atamasco (Linnaeus) Herbert is a spring flowering species of the southern United States (Virginia to Florida and west to Alabama) usually found in swamps and damp clearings. Broad grassy foliage appears in winter and plants go dormant in summer. 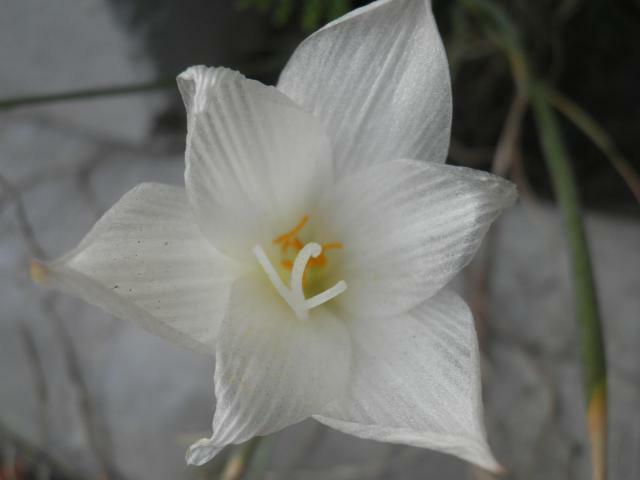 The white flowers are very large. 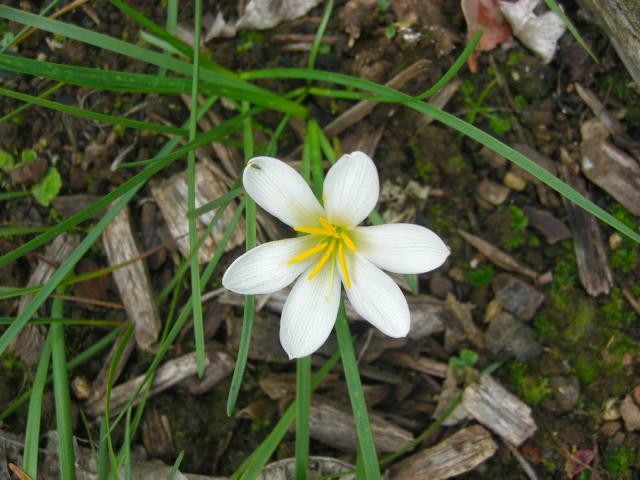 The first two photos, taken by Bob Rutemoeller, are of a March flowering in Northern California. The second photo was taken more than two weeks after the first. 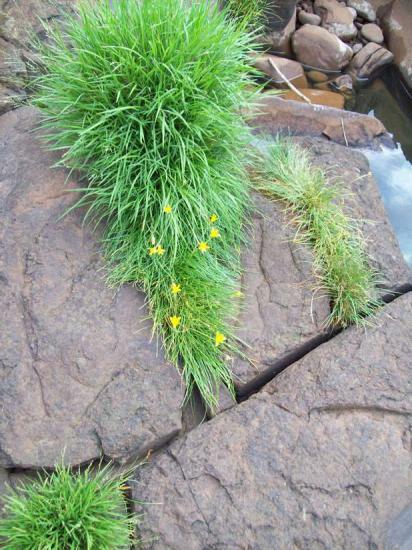 The original flower from the first picture is in the background and has red markings. 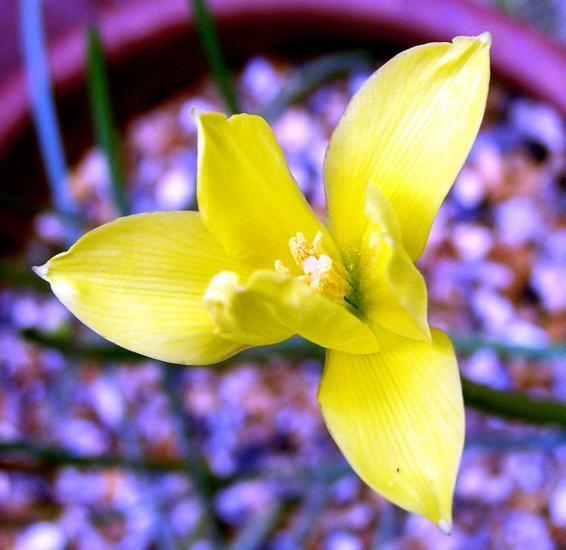 The third photo, taken by Mary Sue Ittner, shows an unusually early bloom in January 2005. 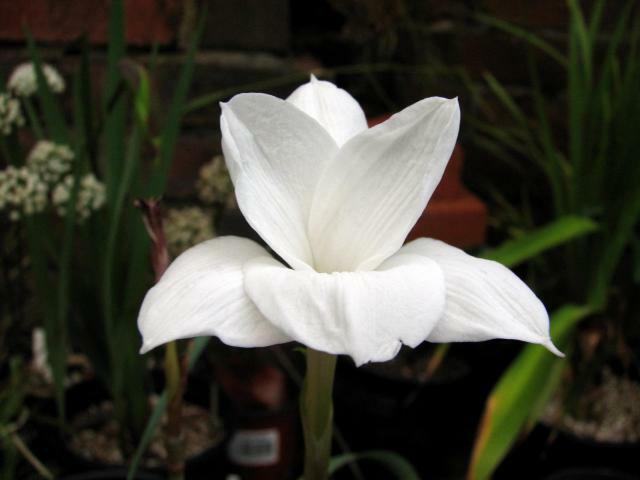 Mary Sue was able to grow this species for quite a number of years in her garden in a container, watered occasionally in summer, but otherwise exposed to the elements. 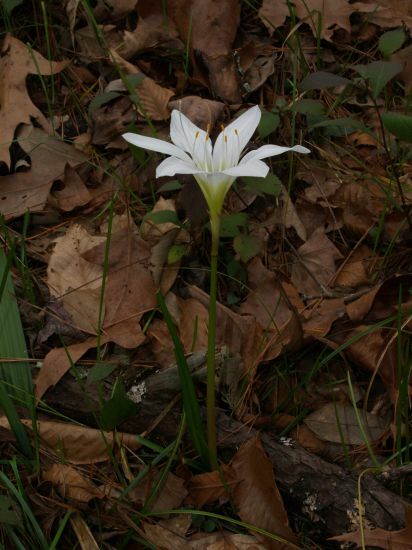 The next two photos, of wild plants in North Carolina, were taken by Jay Yourch and Jim McKenney. 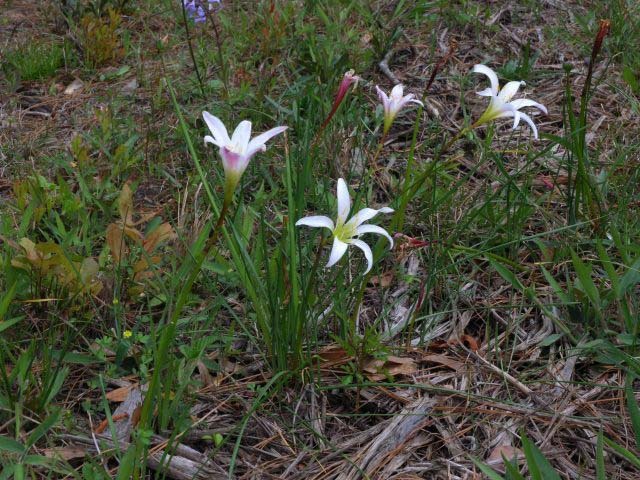 Photographs of Zephyranthes atamasco at a famous location near Chattahoochee, Florida taken in January 2007 by Alani Davis. 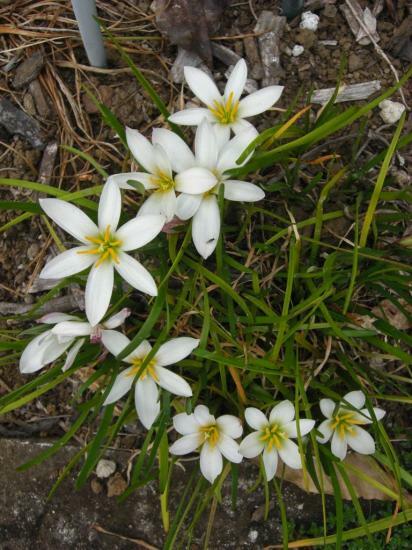 Zephyranthes candida is a widespread species that can be found growing in the wild from the southern United States to South America. 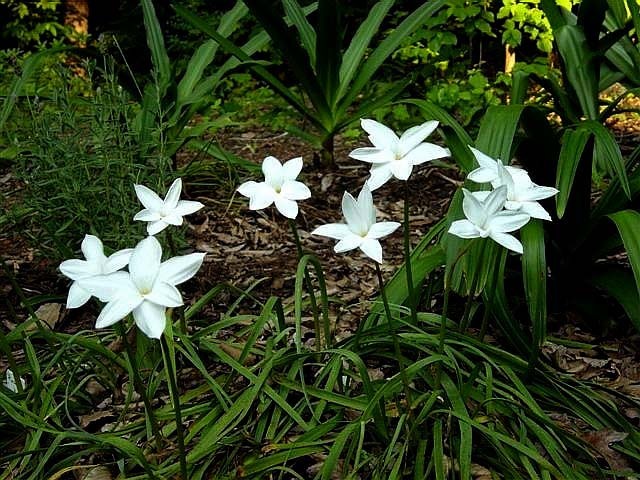 It is thought to be native to Argentina and Uruguay and is found along rivers and in marshes where it gets year round rainfall except for a brief period in late summer. 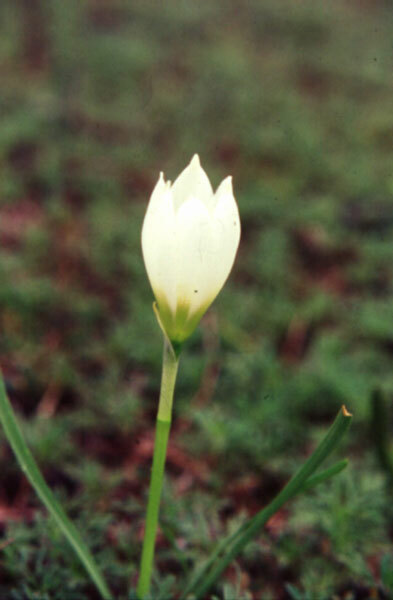 This species may be more widely grown than any other of the genus. 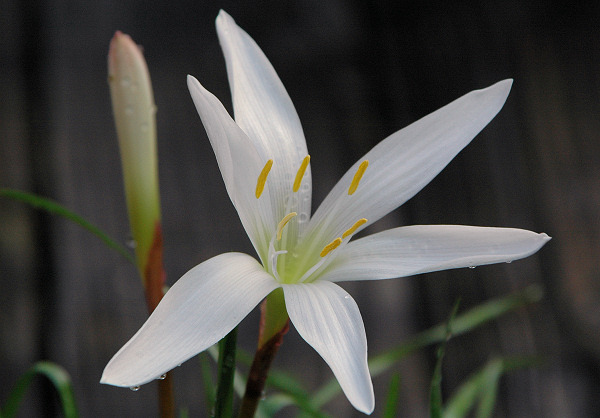 It blooms in fall in response to rain storms. There are many forms that circulate in cultivation because of its ability to readily make seeds. This species likes a nice and warm summer. 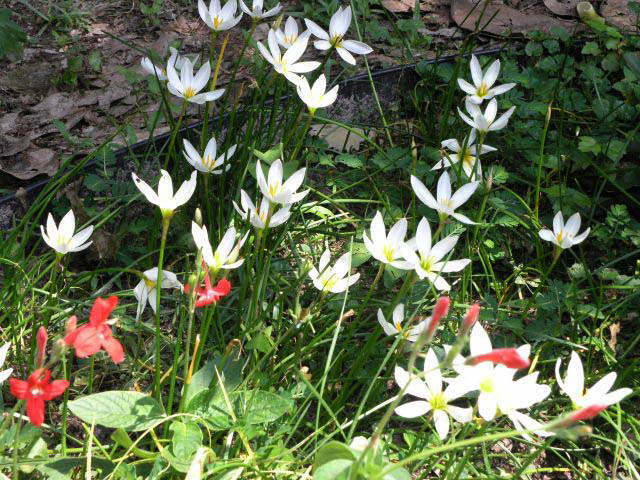 Nhu Nguyen grew this species in Louisiana where it gets brutal full sun but it loves the climate and multiplied readily. 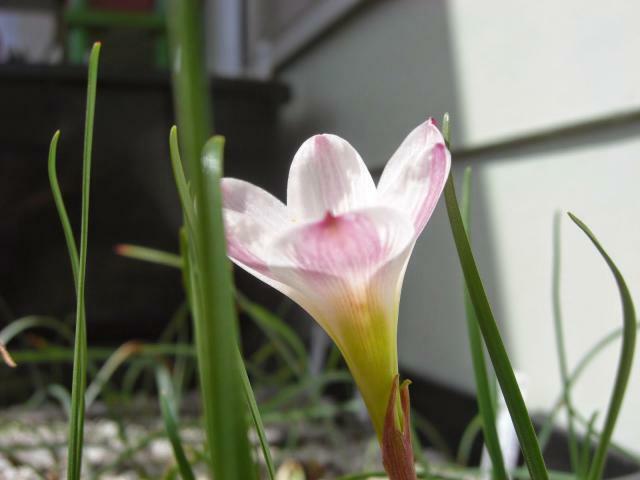 It bloomed periodically from spring to autumn. Winter temperatures can drop way below freezing for several days but the plants hold on to their leaves and recover without trouble. 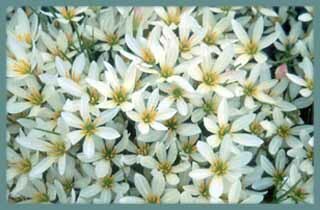 It is a very easy and rewarding species for warmer climates. 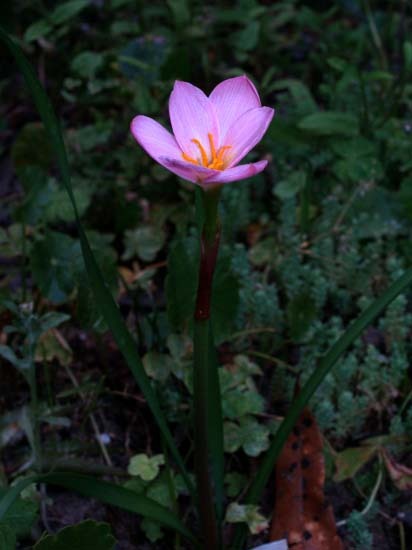 In places with cooler summers in coastal California, it grows slower but still blooms nicely when the temperatures are warmer in the autumn. This species can tolerate a wide variety of soil conditions but seems to like moist (almost wet) and rich soils the best. 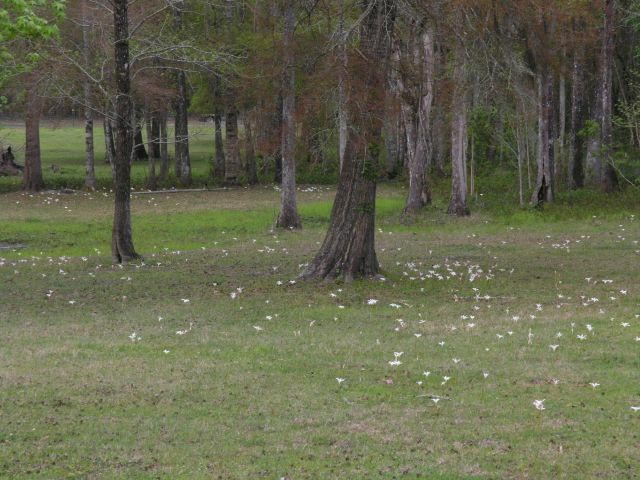 It can catch Stagonospora curtisii when conditions are unfavorable. 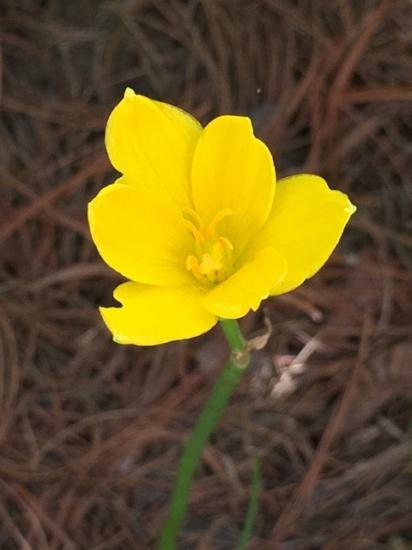 The photos below were taken in the Florida panhandle by Alani Davis where these plants grow happily in their native habitat. 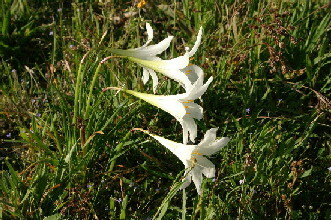 Photo 1 was taken by Lauw de Jager showing a massed blooming in France after a good fall rain and a dry summer. 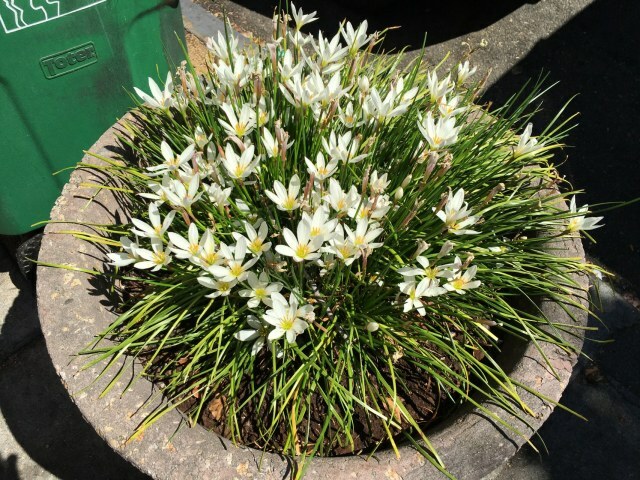 Photo 2 taken by Bob Rutemoeller is of plants growing in a tub along with a Meyer lemon, where they bloom really well in early fall. 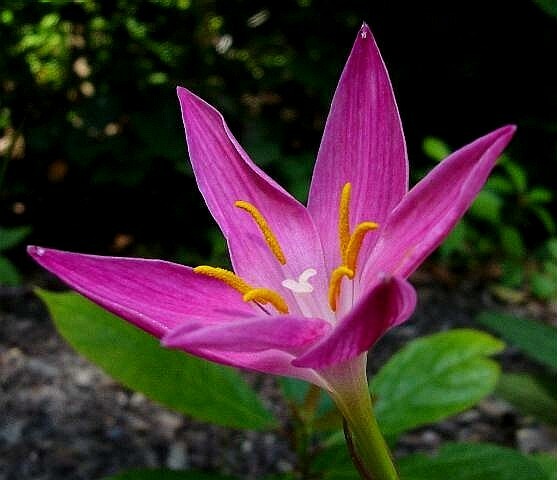 Photos 3-4 were taken by Nhu Nguyen at the UC Botanical Garden of plants originating from Argentina. 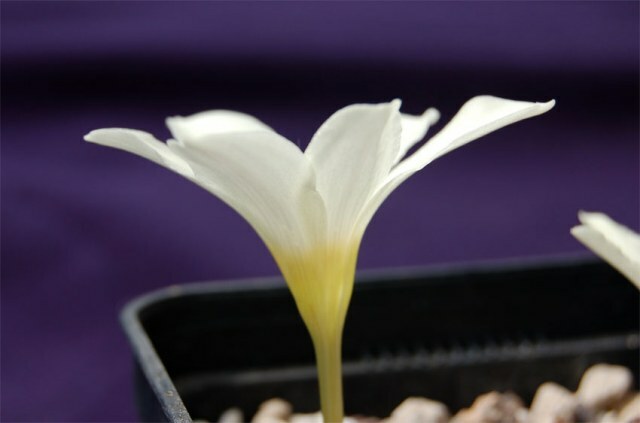 These plants have much larger petals and are much more impressive than the ones we often see in cultivation. 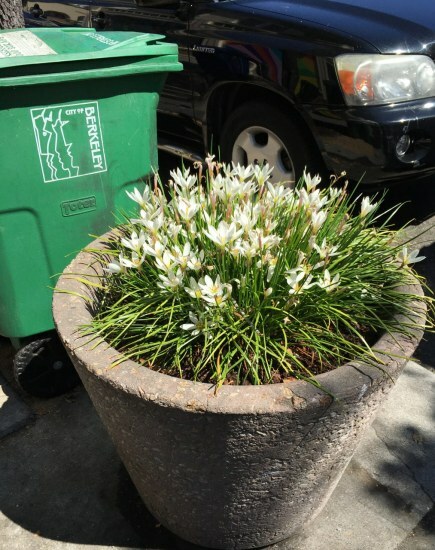 The photos below were taken by Jacob Uluwehi Knecht showing plants growing in a large container in Berkeley, California blooming happily. 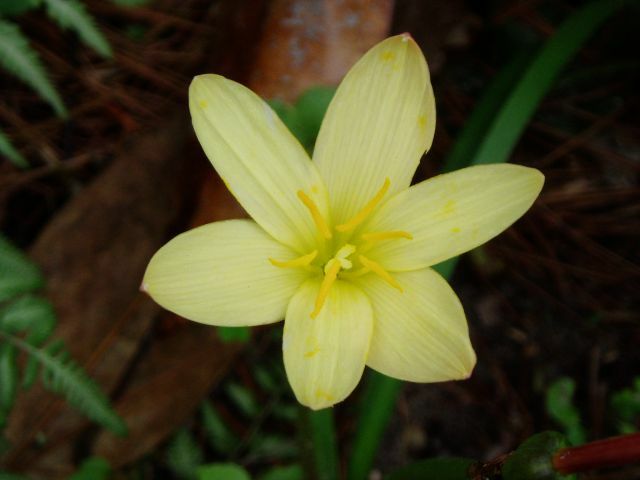 Zephyranthes citrina is native to the Yucatan peninsula in Mexico. 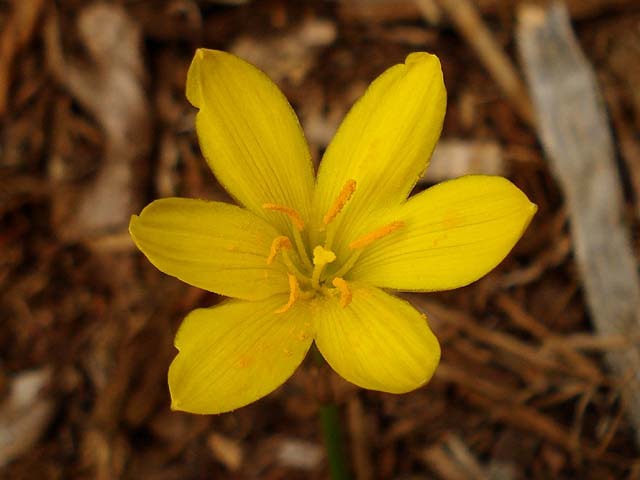 It has small, deep yellow flowers that very much resemble Z. flavissima. The photos of these two species on the web are impossible to tell apart. 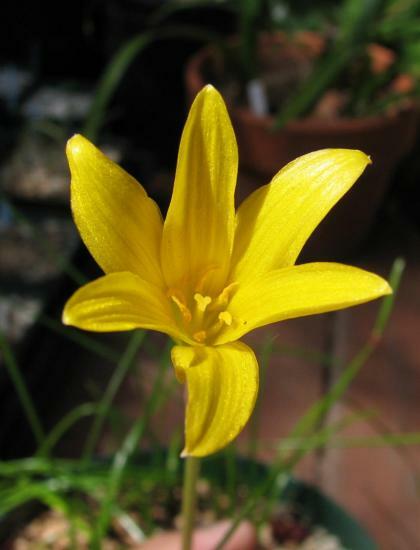 Zephyranthes citrina has 48 chromosomes, which helps to differentiate it from the 14 chromosomes of Z. flavissima of South America. The photos below were taken September 2007 by Jay Yourch. This form does not offset much, but a large colony of them can be built up quickly because of the abundant apomictic (sexual reproduction without fertilization) seed production. 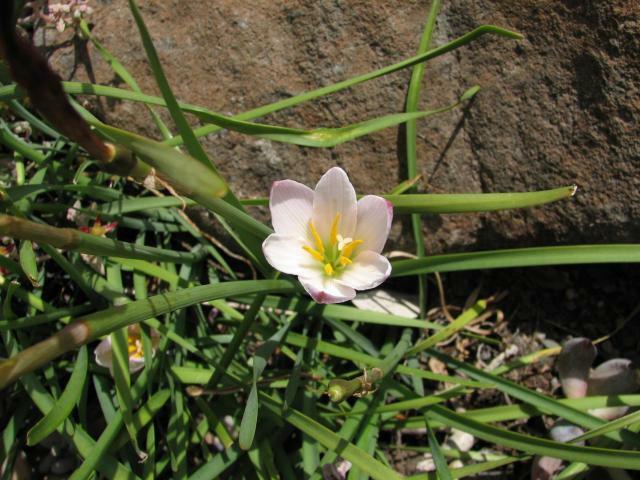 Zephyranthes drummondii D. Don, (syn. 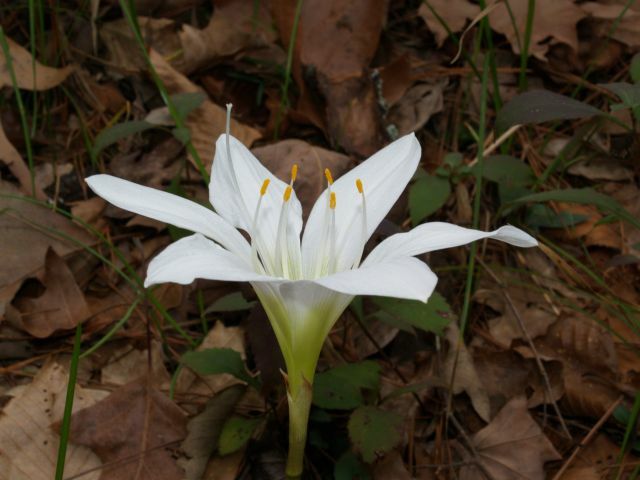 Cooperia pedunculata), known by the common name of giant prairie lily, is native to Texas, New Mexico and Mexico and has a large, white flowers opening in the late afternoon or evening from spring into summer, sometimes later if the conditions are optimal. Photos 1-3 were taken June 2006 by Jay Yourch & Alani Davis. 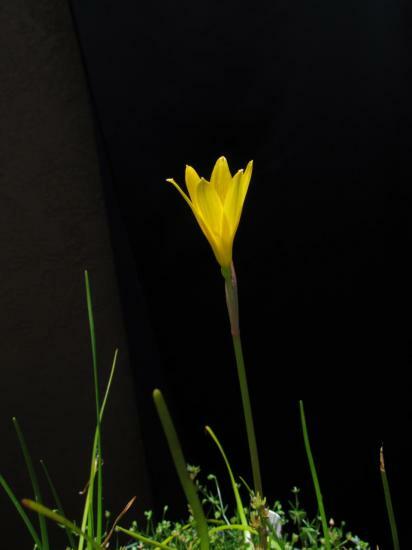 Photos 4-6 were taken by Nhu Nguyen of a form from Telos Rare Bulbs. This form is able to make seeds without needing another clone. 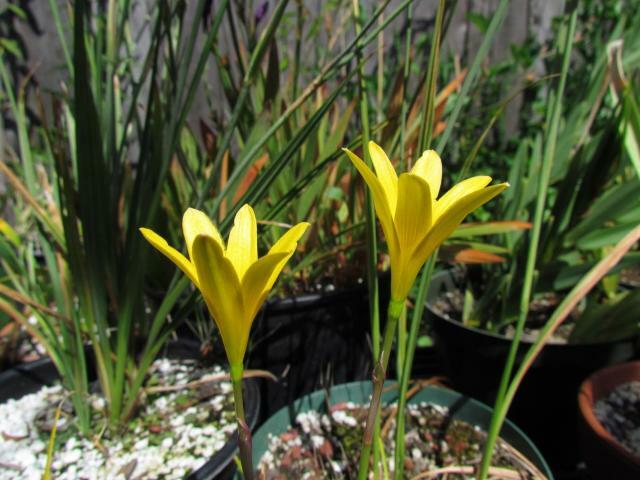 Zephyranthes flavissima is native to southern Brazil to northeastern Argentina. 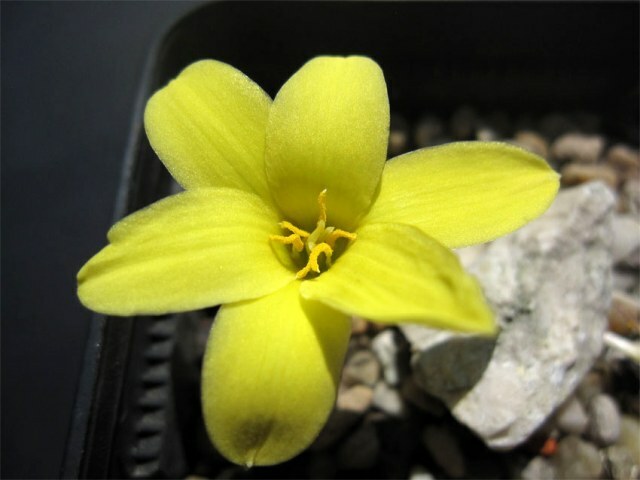 The flowers are bright yellow, much resembling Z. citrina. 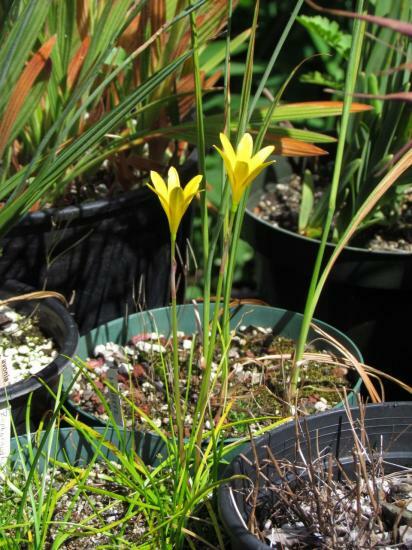 Zephyranthes flavissima has 14 chromosomes, which serves to differentiate it from Z. citrina (see Z. citrina entry above). It is almost impossible to tell these two species apart from the images posted on the web. 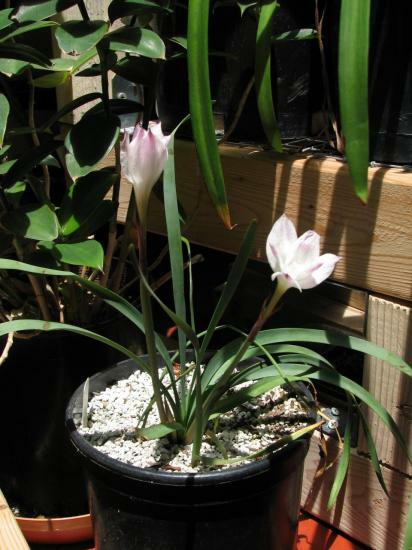 Alberto Castillo provided some key characteristics: Morphologically, Z. flavissima with leaves that grow in fountain fashion and the bulbs that are strongly offsetting rapidly forming a lawn. The leaves are a fresh green, shining, not dull (as in Z. citrina). 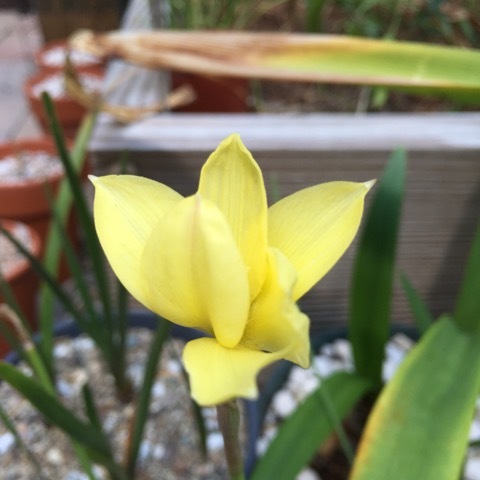 The flowers have a canary yellow, and not as deep of a yellow as Z. citrina. The tepals are evidently subequal, that is the three outer are not exactly like the three inner as in Z. citrina. In cultivation, when enough water is provided in summer, the plants will remain evergreen without losing their leaves. 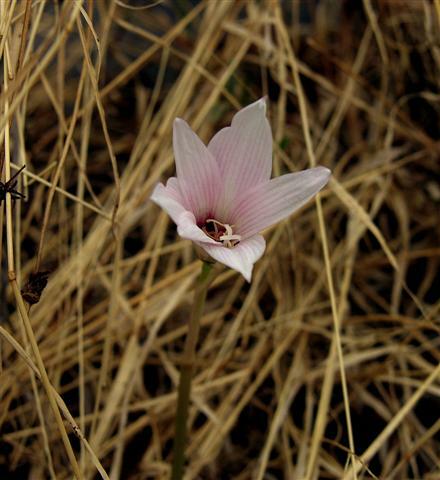 The photos below were taken by Tarcísio Eduardo Raduenz of plants from habitat at the border of Argentina and Brazil. 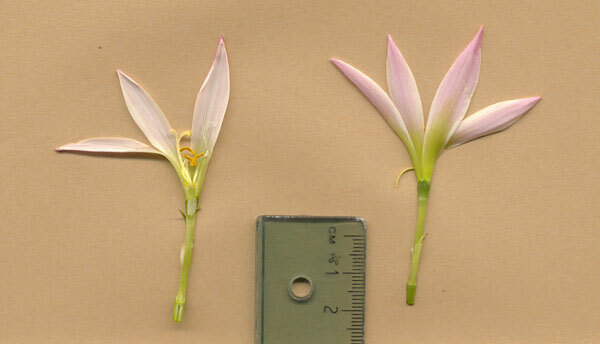 The photos below were taken by Nhu Nguyen of plants that originated from the same population as pictured above. 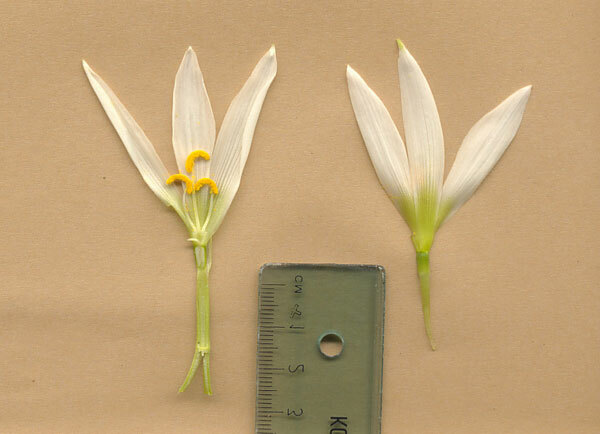 Although these look different in the photos, they are of the same plants, just different year of blooming. 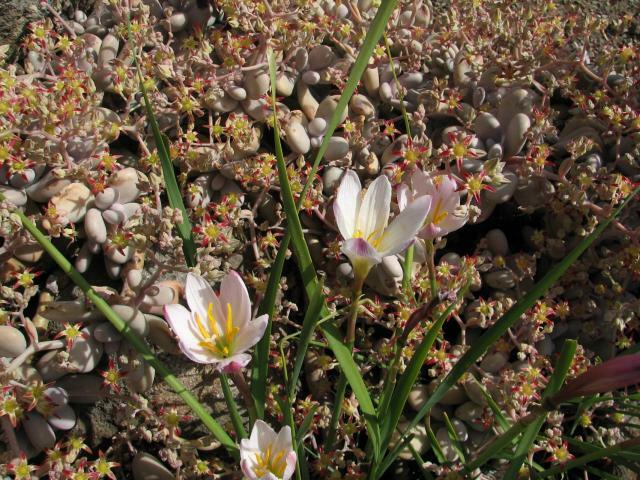 In the Bay Area, it does fine outdoors, and keeps its leaves year round when moisture is provided. 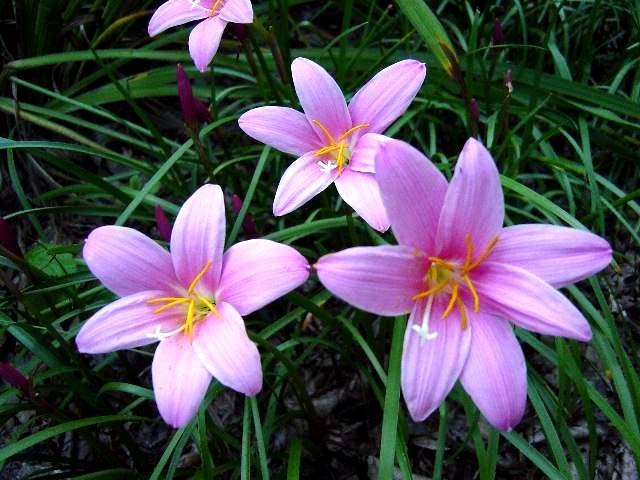 It blooms mostly in summer and autumn. 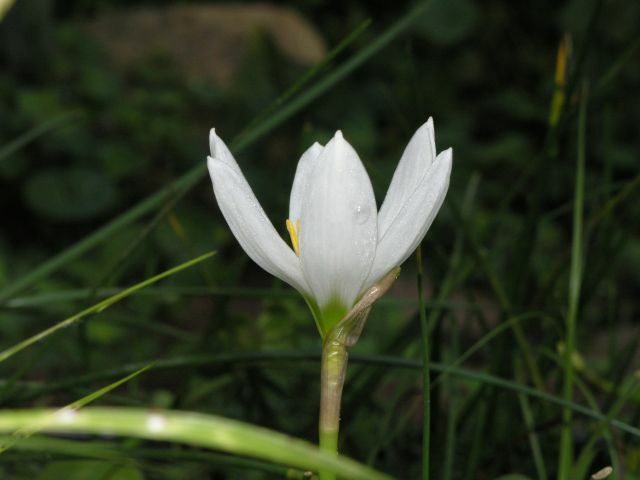 Zephyranthes fosteri is from Mexico, where it is known as "little May flower". Photos 1-5 were taken by Nhu Nguyen at the UC Botanical Garden. 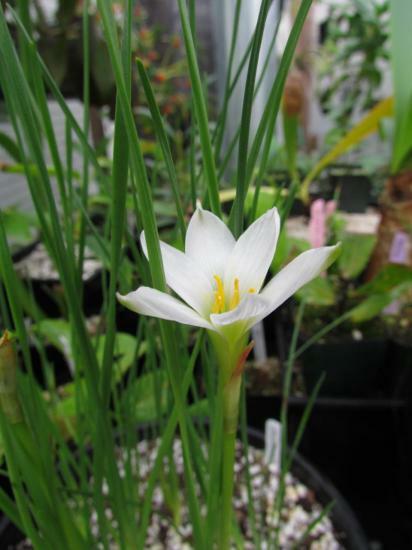 Zephyranthes grandiflora is native to Central America. Photos taken June 2004 by Jay Yourch. 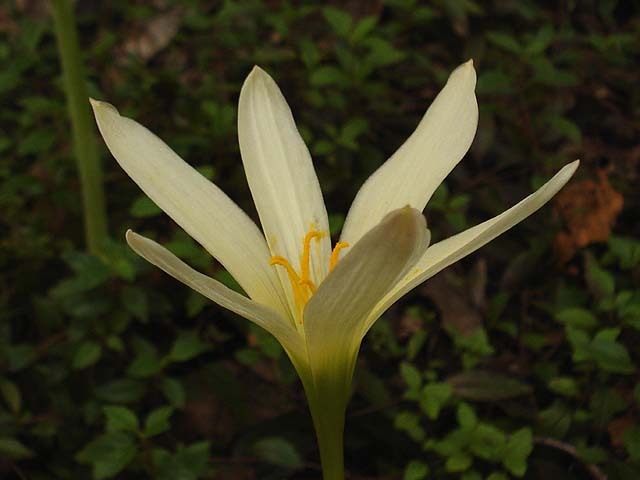 Zephyranthes guatemalensis is native to Guatemala. 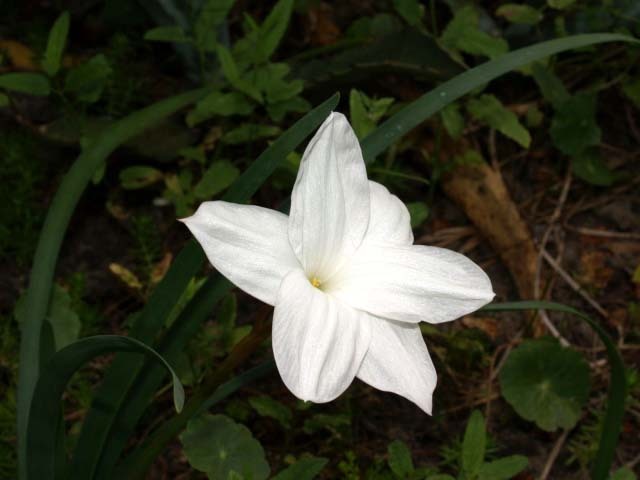 It has large white flowers and are quite elegant. 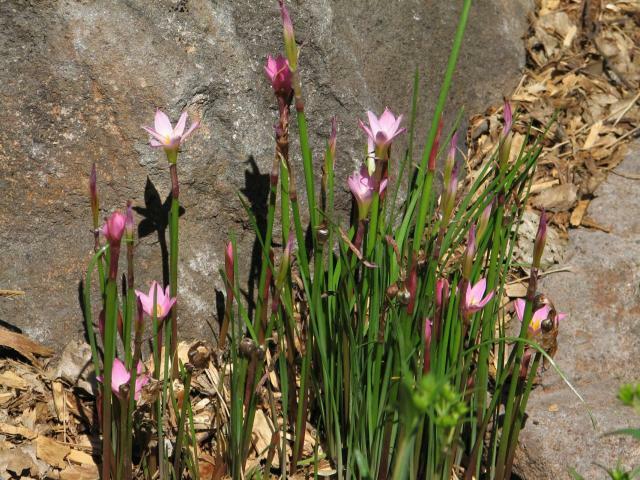 Zephyranthes lindleyana is native to eastern Sierra Madre of Mexico. Photos taken April 2007 by Alani Davis. 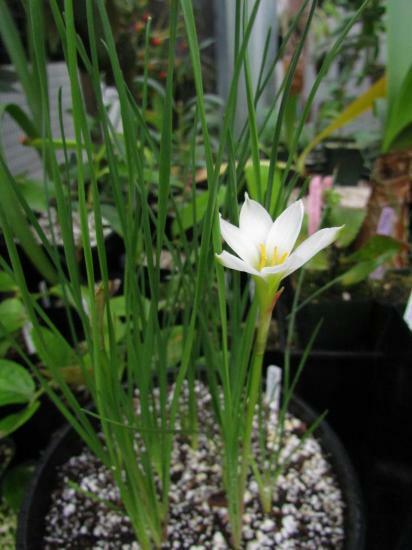 Zephyranthes macrosiphon is native to eastern Mexico. 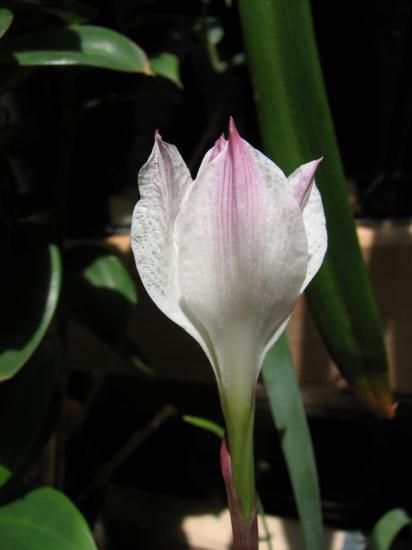 It resembles Z. grandiflora, but has smaller flowers with shorter styles. Photos 1-2 were taken August 2004 by Jay Yourch. 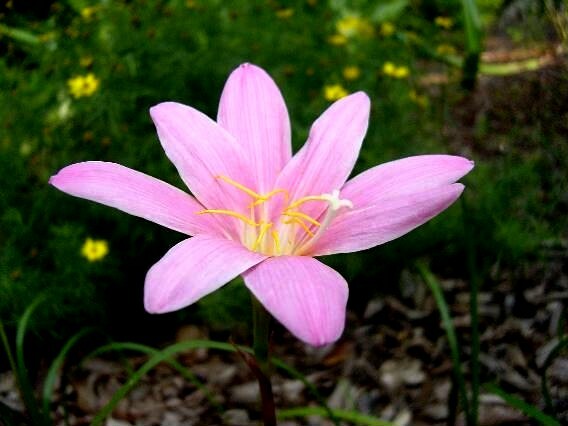 Zephyranthes mesochloa is native to South America and has white or pink flowers. Here you can see two different populations of Z. mesochloa photographed by Germán Roitman. 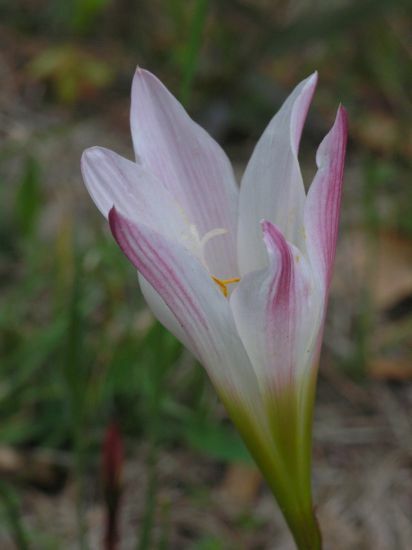 Zephyranthes minima is white flushed pink on exterior of segments and native to Argentina, Bolivia (at altitudes of up to 2600 m), Uruguay, Paraguay, and Brazil. Photo by Alessandro Marinello. 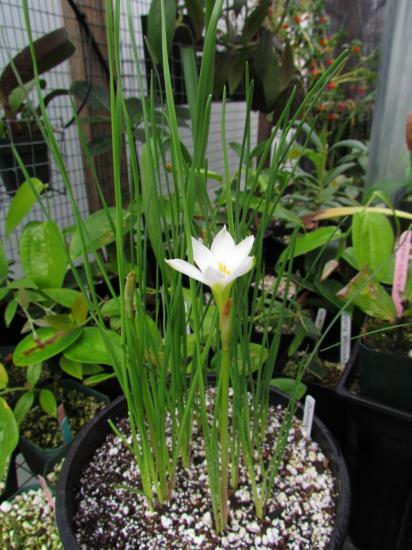 Zephyranthes nelsonii is a rare species that I have never seen in cultivation. 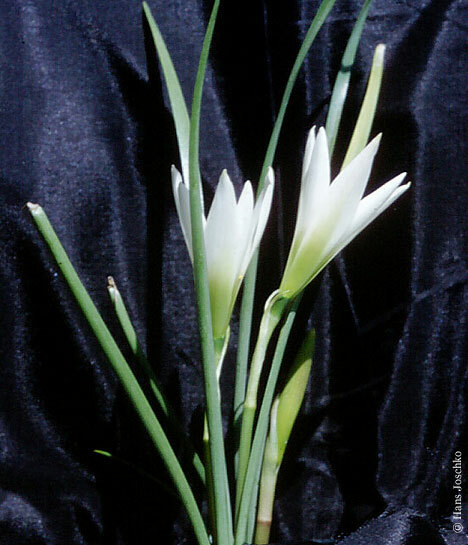 The scapes are quite tall (about 12 inches high) and the flowers are quite large, as well (4-5 inches in length). It is found in rocky, xeric escarpments and consequently I would imagine that it requires very good drainage. 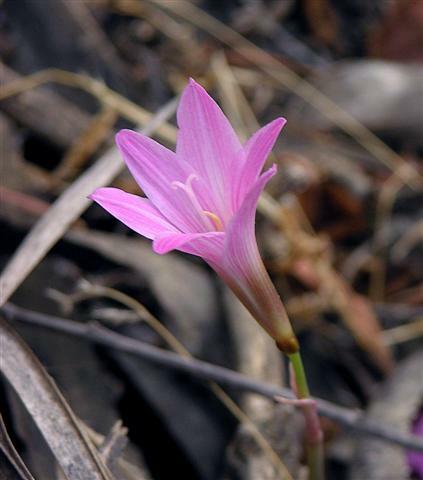 It is sympatric with Sprekelia drummondii and Tigridia sp. as they share the same habitat. 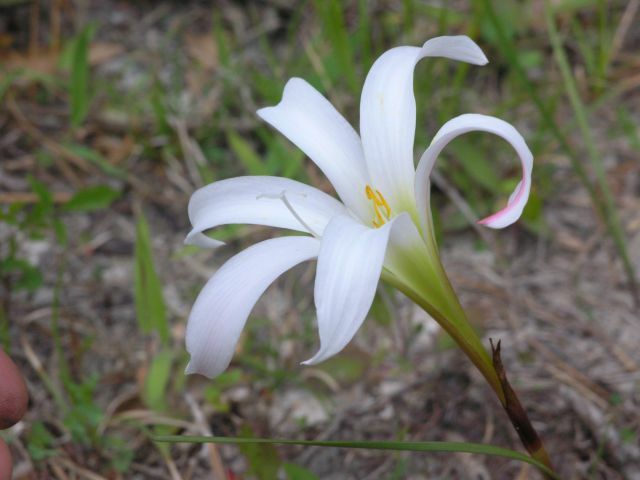 (Sprekelia plants were blooming simultaneously a few feet away when these pictures were taken.) 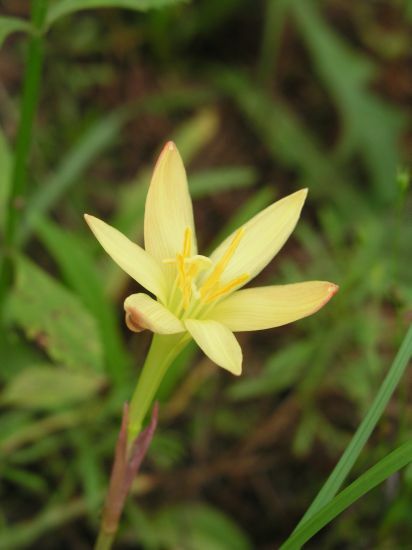 The plants were located in their natural habitat at roughly 2000 m in Zumpahuacan, Mexico (1 hr. south of Mexico City). I took pictures of two color variants. 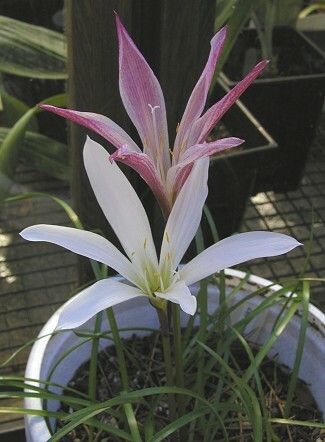 One is a light pink color with red stripes on the petals; this is the predominant color form. However, there was also a semi-alba variety that was growing in the same patch as these others, and is likely a mutation of some sort. I am not sure of the frequency with which this color variation shows up... it could actually be quite common. Some extra field work should answer that question. Photo taken April, 2005 by Dennis Szeszko. 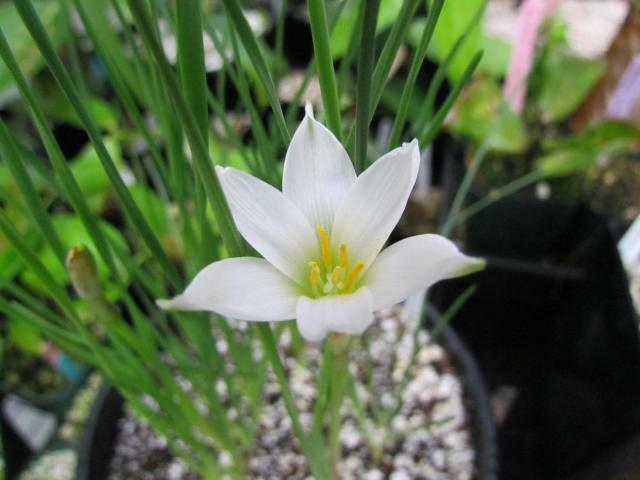 Zephyranthes primulina is another really pretty Zephyranthes. 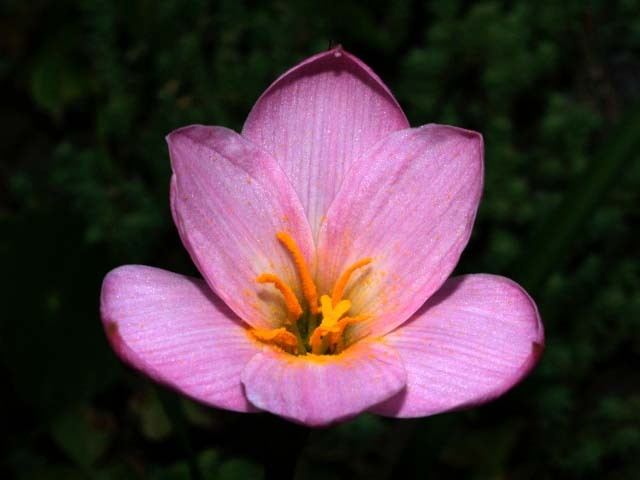 The outside, before the flower opens, is a yellow fading into a pink-peach color. Photo taken August 2003 by Lee Poulsen & 2005-2006 by Alani Davis. 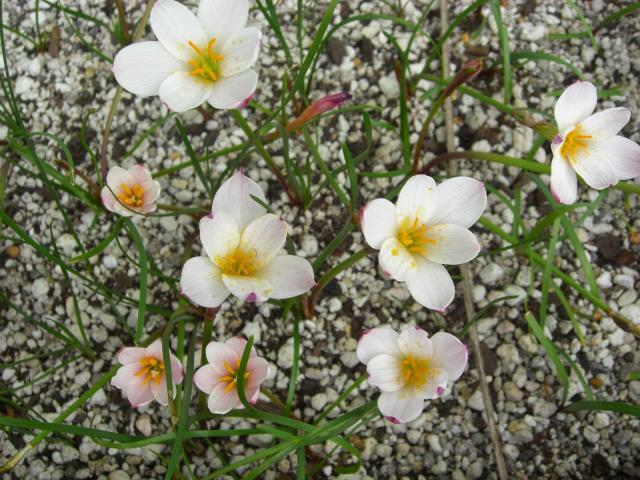 Zephyranthes pulchella J.G. 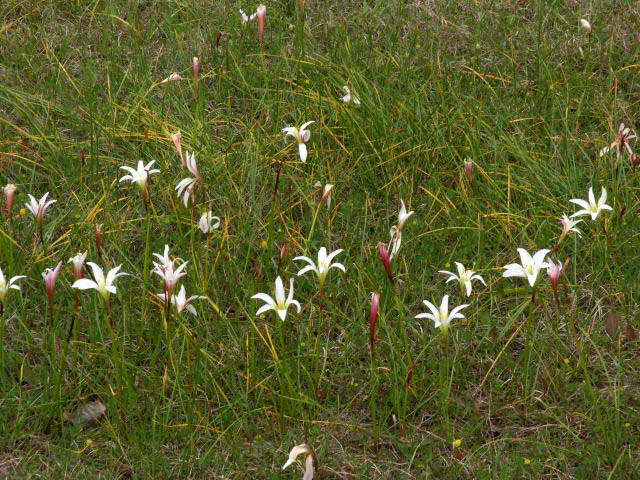 Smith is found in the coastal prairies and wet roadsides of eastern Texas and Gulf Coast Louisiana. 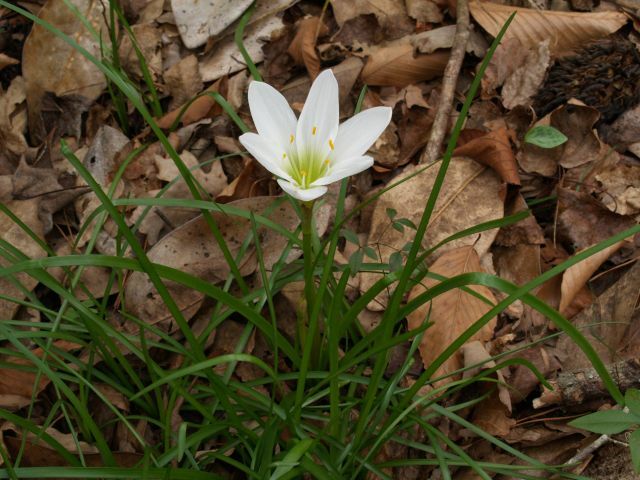 The leaves grow through the winter and spring and die off in summer; flowering occurs in autumn. 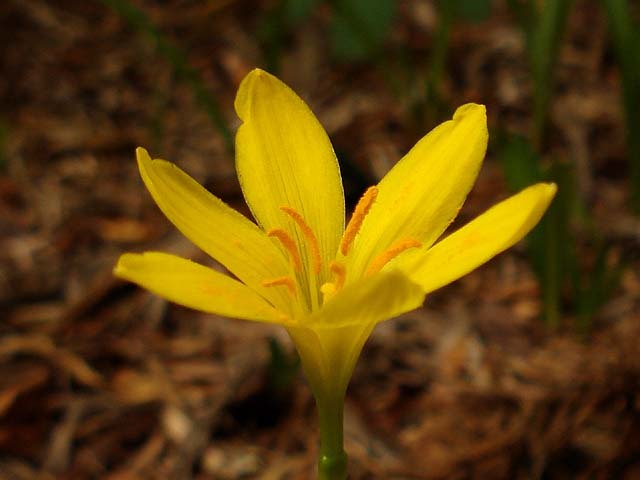 Leaves are linear and sedgelike and flowers are golden yellow. Pulchella means "pretty". 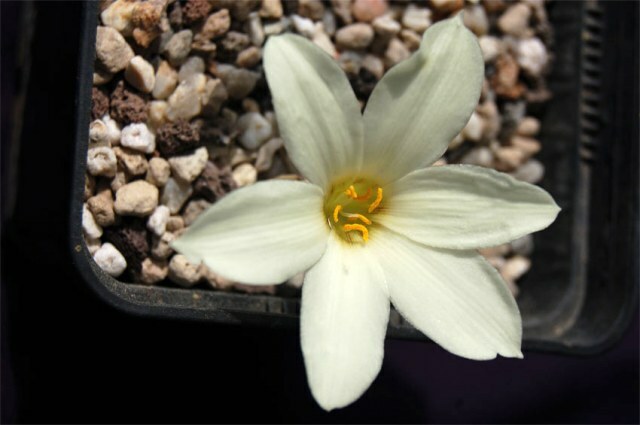 Photo by Rimmer de Vries of plant obtained from BX402. 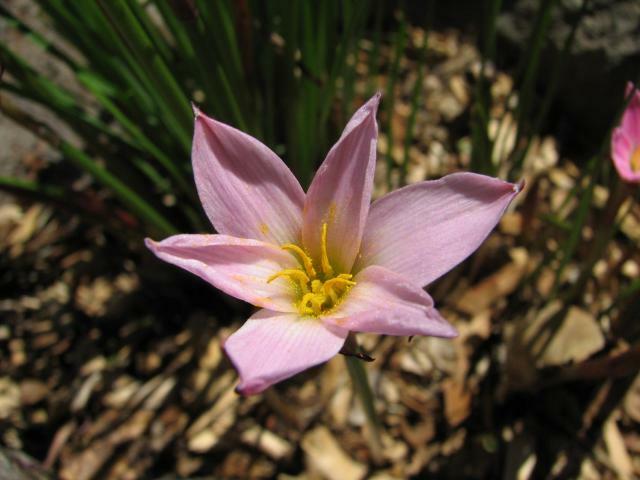 Zephyranthes reginae is native to Mexico. 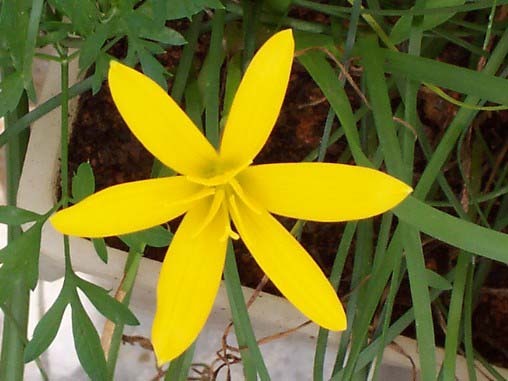 It has moderate sized light yellow flowers. Like Z. citrina, it does not offset much, but a large colony of them can be built up quickly because of the abundant, possibly apomictic, seed production. Photos taken by Jay Yourch & Alani Davis. 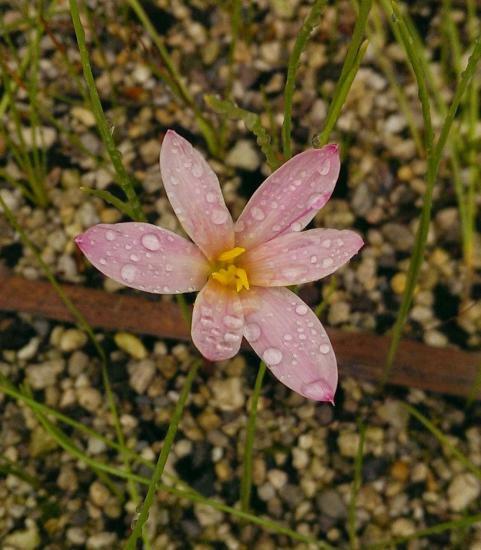 Zephyranthes smallii (Alexander) Traub, syn. 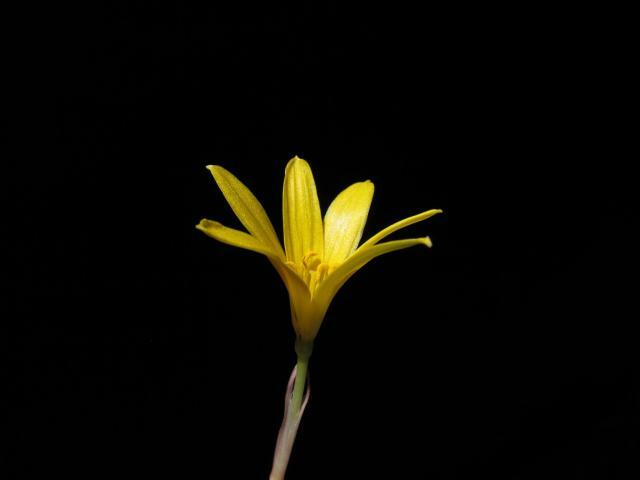 Cooperia smallii, was found in low, sandy loam and open fields, swales, and ditches in and around Brownsville, Texas. 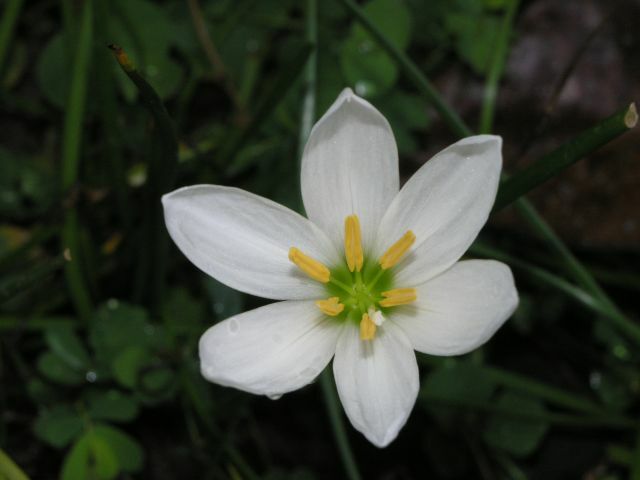 The Flora of North American states: "Morphology, cytology, and distribution suggest that Zephyranthes smallii (predominantly 2n = 54) arose from hybridization between Zephyranthes pulchella (2n = 48) and Z. chlorosolen (2n = 60 in Cameron County) in Brownsville." According to Jim Shields' garden notes because the area where it was found has undergone extensive development, it may be extinct in the wild. The leaves are 5 mm wide. 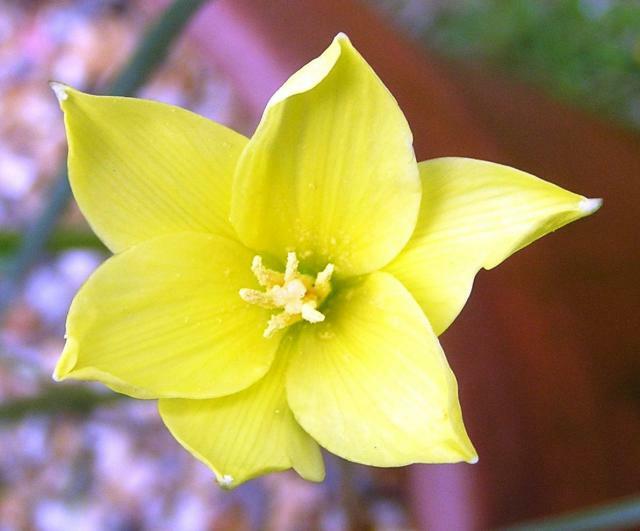 The lemon yellow flower is held erect. 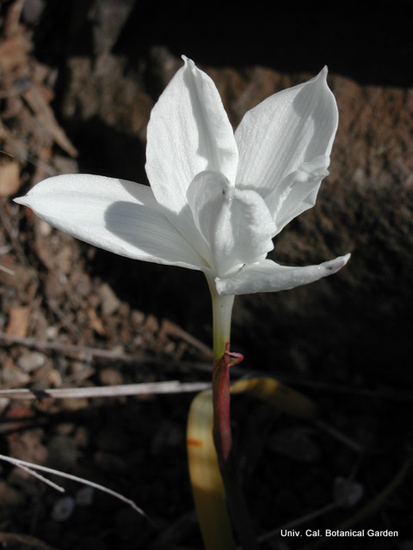 The cylindrical perianth tube is shorter than the spathe and 3 to 5 times as long as the filaments; the stigma is capitate. 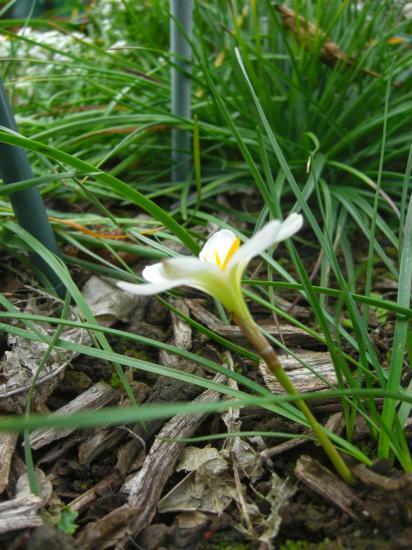 Flowering is in early fall (September to October). Photos 1-3 by Ralph Carpenter. 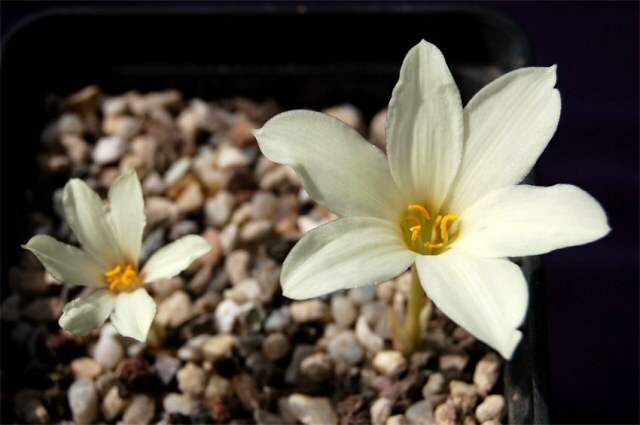 Photo 4 by Rimmer de Vries of plant obtained from BX402. 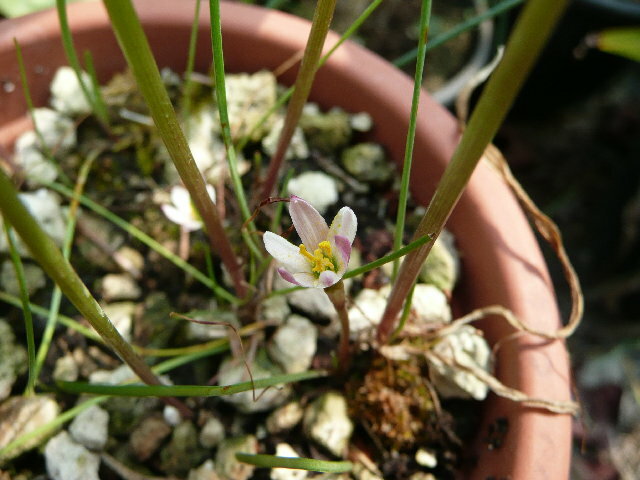 Zephyranthes sp. Argentina photos were taken by Hans Joschko of plants obtained from a friend that originally were collected in the northern provinces of Argentina, in the border region between Salta and Tucuman at 1100 meters. 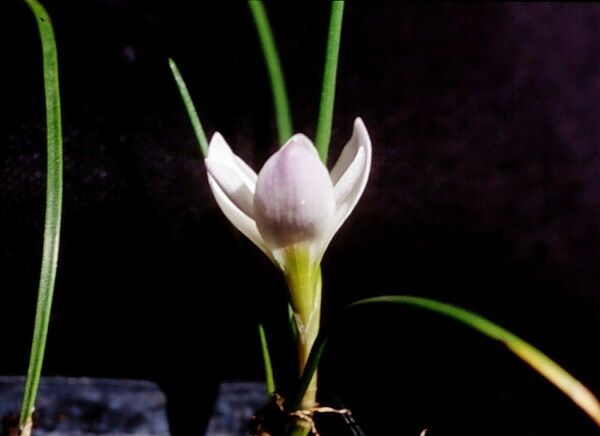 Germán Roitman thinks it is Z. mesochloa, but Alberto Castillo thinks it may be a new species because Z. mesochloa is a lowland plant. 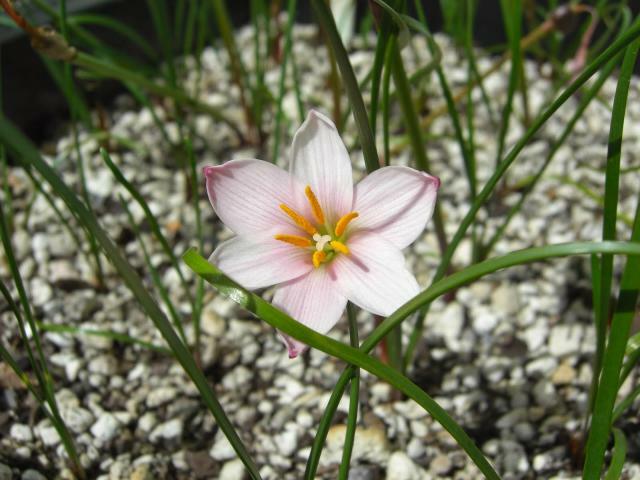 Zephyranthes sp. Itajaí photo by Tarcísio Eduardo Raduenz was taken December 2006 of a plant originating from Itajaí, southern Brazil. 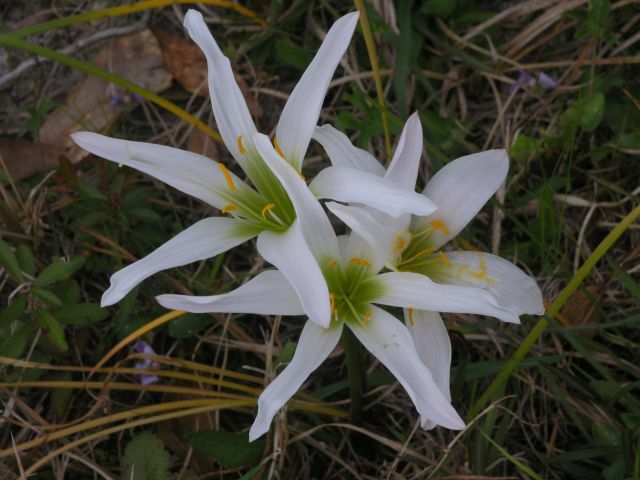 Zephyranthes sp. Mexico photos below were taken by Nhu Nguyen at the UC Botanical Garden. 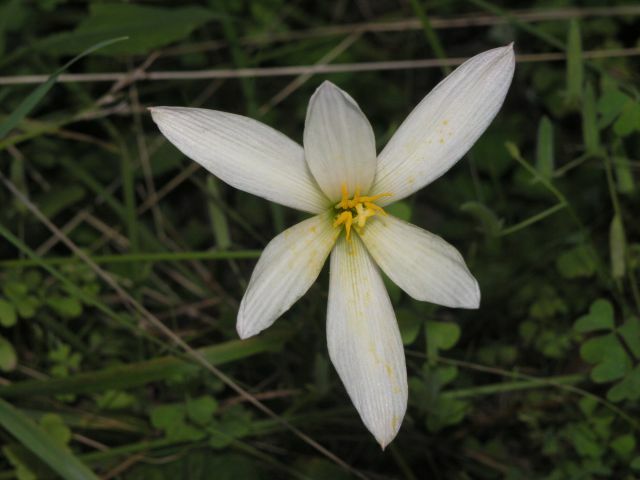 Zephyranthes sp. 'Labuffarosea' (sometimes spelled as 'Labuffarosa' or 'Labuffarosae') is an unsubscribed species (or natural hybrid) that is widespread in cultivation. 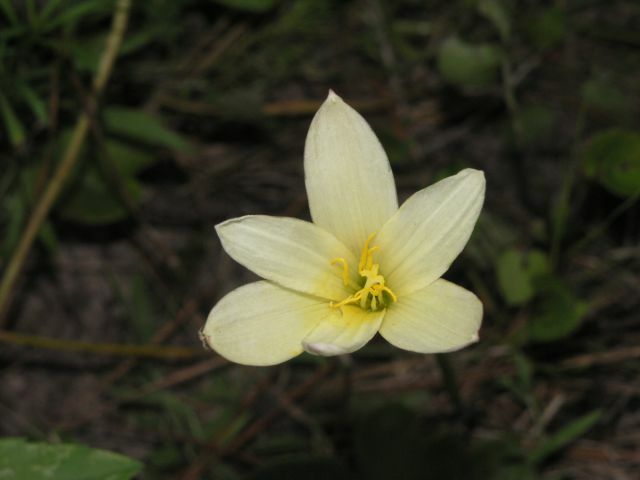 It is similar to Z. grandiflora, but the leaves are dark green leaves and the flowers open rather flat with very broad tepals. See the 'Labuffarosea' entry. 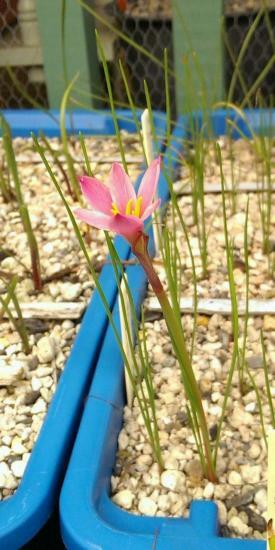 Zephyranthes sp. was found in the southern Baja California peninsula by José Luis León de la Luz, an investigator from CIBNOR. 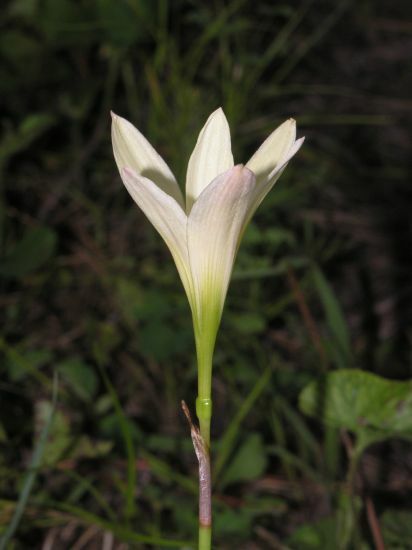 It did not match other species found in that area, Habranthus arenicola or Zephyranthes longifolia. 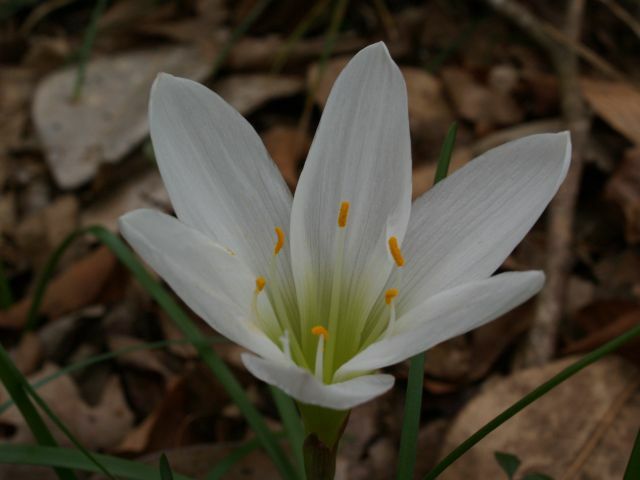 His photo was added to the Mystery Bulbs page, but the consensus was that there wasn't enough information to make a guess what species it might be. 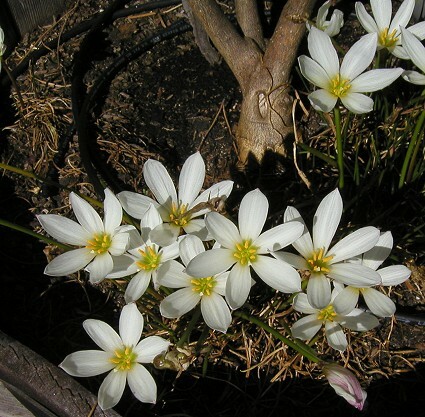 Zephyranthes traubii is a species named for Hamilton Traub who spent much of his career on the taxonomy of North American bulbs. 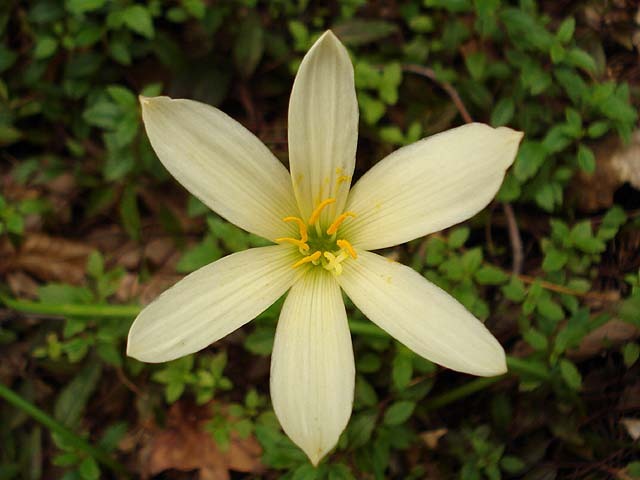 It is native to southeastern Texas and northeastern Mexico. 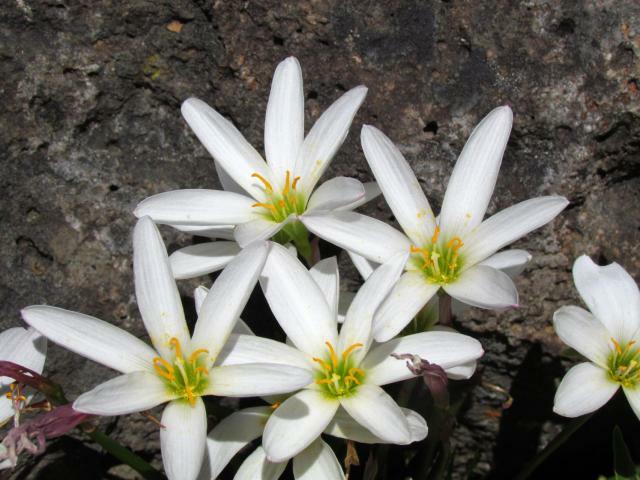 The photo below was contributed by the UC Botanical Garden of a form from Nuevo Leon. 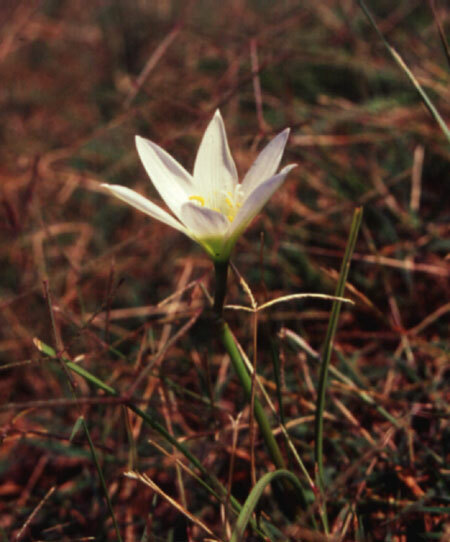 Zephyranthes treatiae was a separate species but is now also called Zephyranthes atamasca var. treatiae (S.Watson) Meerow. These are wild examples in Jefferson County, Florida. Photos by Alani Davis. 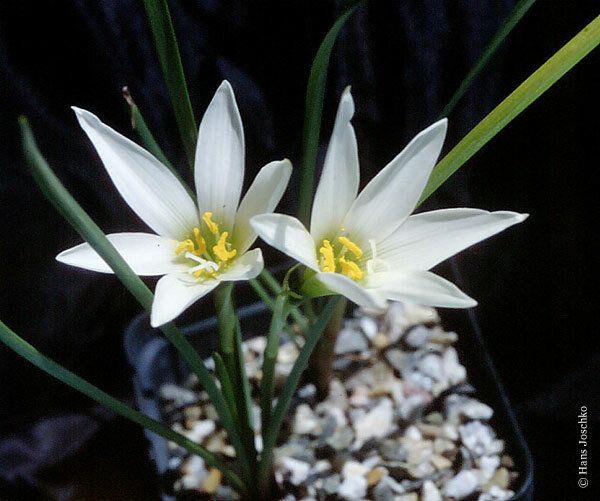 Zephyranthes verecunda is a species that is rarely seen in cultivation. 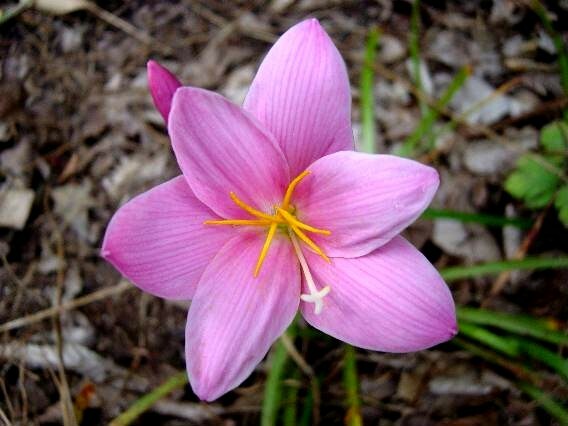 The flowers in the picture emerged after the first rains in Mexico during the last week of April, 2005. 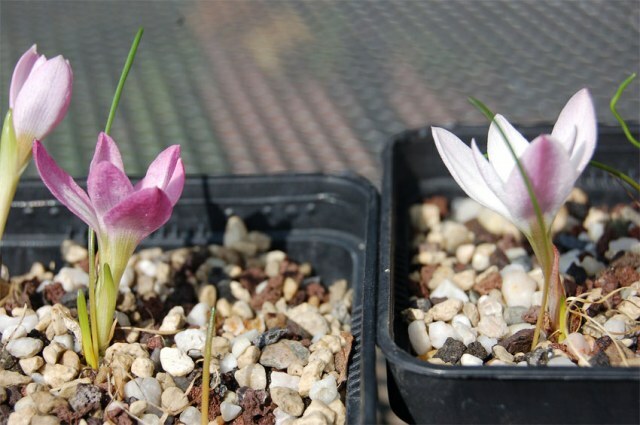 The small but intensely colored flowers are held on a very short scape and resemble Crocus sp. in their shape and size. 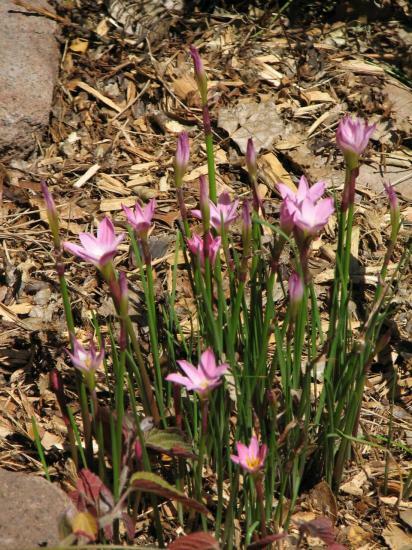 The flowers open in direct sunshine and are a dark magenta color. 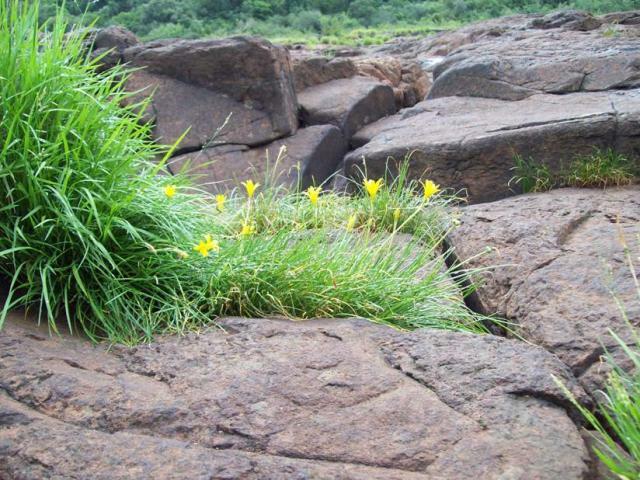 The plants were located in their natural habitat at roughly 2000 m in Zumpahuacan, Mexico (1 hr. south of Mexico City) in direct sunshine in a grassland growing in sandy soil over buried rocks. Photo by Dennis Szeszko. 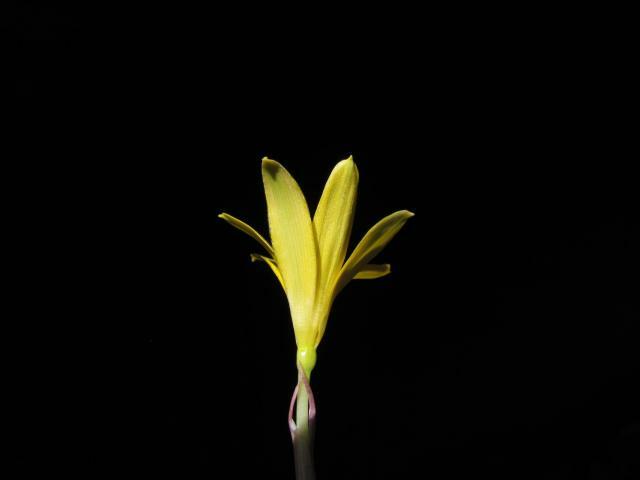 Photographs of garden plants by Ina Crossley. 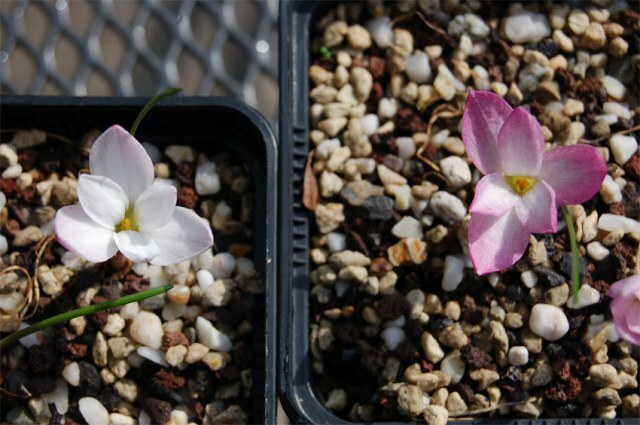 See Zephyranthes fosteri for a note on the differences. 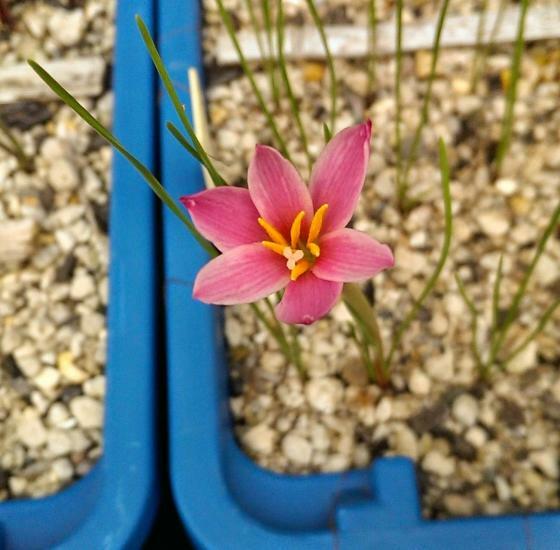 The photos below are of plants cultivated from seeds that came from a grower in Brazil. 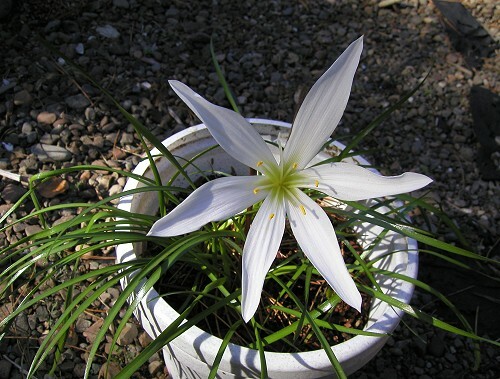 They came as Zephyranthes "datensis" but this name does not exist in taxonomic databases. 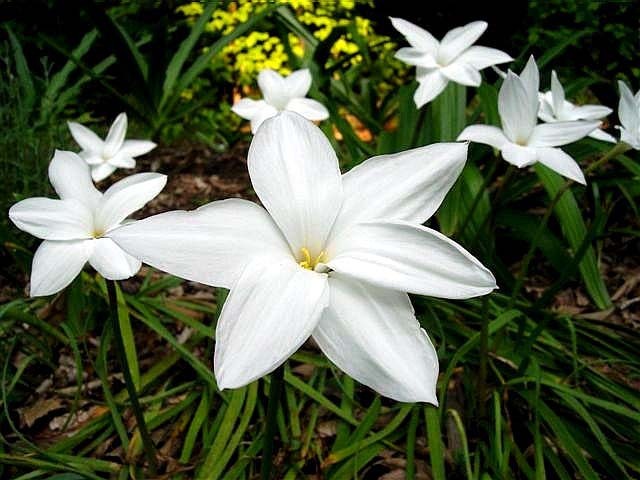 Seeds and bulbs have been distributed over the years by Nhu Nguyen under this name and those who have this plant should give their plants the proper name. Photos taken by Nhu Nguyen. 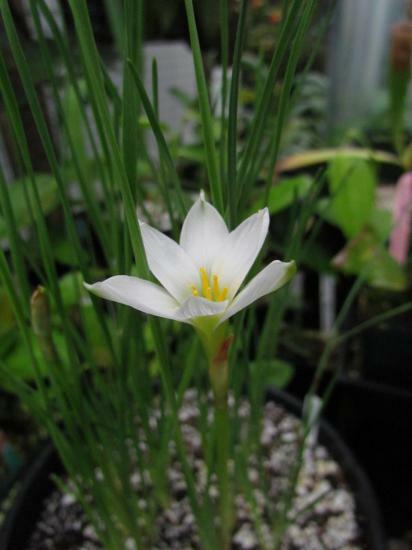 Zephyranthes versicolor is pictured on the Habranthus wiki page.